On July 12, we were on our way to Sohun for the next NITI course. Gertrude is no busy leading another literacy workshop. This is the group that she worked with early this year. They are beginning to review the materials that they already finished and learning how to use them. They will also be producing new material which will include materials to help education the people about AIDS/HIV and how to prevent the spread of it. This is becoming more and more of a problem here in Papua New Guinea. At present I have been helping everyone with their computers and email. In another week the Notsi translation team will arrive and I will begin to work with them to edit and update the book of Mark and Luke. We hope to be able to have Luke finished next year to be able to work on script the JESUS film to be dubbed into Notsi. Yesterday, Gertrude and I went to a special program at the local primary school. There were the usual cultural songs and dances. What made this time special was that I had opportunity to meet Sir Julius Chan. He has known Gertrude for many years because of her work with the Sursurunga. He was very happy to see Gertrude again after so many years and to meet me. We were able to have a few minutes with him to visit with him during lunch before he left. Gertrude asked him if it was true that he ate a noni a day for his health. In fact it was true. He says you begin to get used to its bitter taste. It took Gertrude the longest time just to get me to drink the noni juice. That will be good enough for me. 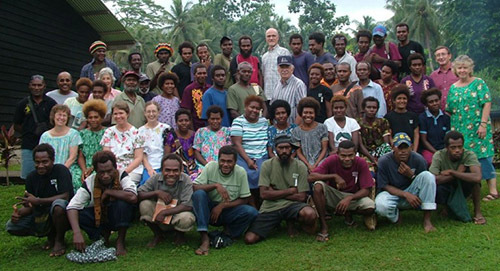 The Central New Ireland Literacy and Scripture Use Course began on Monday May 3, 2010. The theme of morning devotions was ‘prayer’ and although I led most of the devotions, volunteers took turns doing brief devotions from simple devotional from Andrew Murray’s writings on prayer. It was great to see the rapt interest of all who were present. I loved the four part harmony as we sang during devotions. It was a worshipful time that set the tone as our labors began. The course was attended by two pastors, elementary school teachers, local bible translators and others interested in developing literacy materials in their languages. About 17-21 people attended altogether and they were a well chosen group. The Nalik group was represented by three to five people, and the Notsi-Mandak by three or four, and the Notsi by ten people–not all were able to stay the whole time. Sometimes, we worked on a transition primer (a tri-lingual language book designed to help adult readers of English or Tok Pisin transfer reading skills back to their mother tongue). The group wrote traditional stories, began learning how to author a personal devotional book, translated HIV-AIDS, marijuana, and leprosy booklets as well as wrote model letters, and prayers. It was hard work for all of us to stay focused in the tropical heat as the day wore on. We were grateful to have generated electricity for ceiling fans and re-charging computers. In the evenings Kevin showed the video “The Ten Commandments” with Charlton Heston and HIV-AIDS Awareness videos. Everything seems to be going well, until Thursday, when a power surge from the church owned generator blew out a number of adaptors. For the remaining of the time we used our own generator from the village. This is the final week of the February/March session of NITI. This course was different in that it had a literacy segment included which was led by Gertrude. Six of the 13 language groups involved brought in people to work on literacy materials in their languages. Education levels ranged from Grade 8 to College but most were Grade 10 graduates. We got booklets translated or developed for an Easter Bible study, HIV-AIDS, Marijuana, and personal devotional books prepared for publishing. Most of them received computer and typing training for the first time. It is interesting and insightful to see what kind of mistakes a novice may achieve on a computer! By the end of the course all had more confidence and were able to type simple texts. God is good. 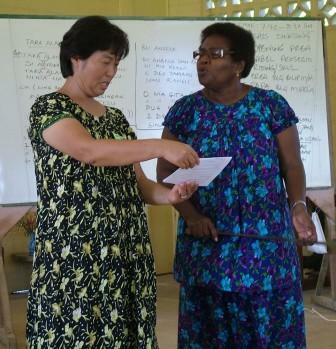 Local translators worked with Wycliffe translation consultants to complete different tasks in this course. Some of them edited newly translated drafts while others prepared for village and consultant checks of different New Testament books including Mark, John, and James and other Scripture texts. Kevin and the Notsi translators worked on editing Galatians, Philippians and Mark in preparation for consultant checking later this year. We stayed healthy although the schedule was busy from morning into the night. Kevin seems ‘fit as a fiddle’ and enjoyed serving others with his computer skills as well as helping the Notsi prepare translated Scripture portions for consultant checking. We found a source on noni fruit and have been enjoying the benefits of its fresh juice daily. It is the middle of rainy season and increase in mosquitoes. Some of the local translators, including Matthew suffered from malaria, bad colds and allergies. Our time at NITI is coming to a close. How quickly the month has passed. We are pleased with the progress that the translators and literacy workers are making. On Wednesday, March 24, will be our last day for this NITI course. The main goal of this particular course was to review and update translations from previous course to prepare them for consultant checking. Following the consultant checking after the recommended changes are done that particular book could be printed. As I am working with the Notsi we are preparing the book of Galatians. We are nearly ready for consultant checking. I am learning to read more and more of the language, but I need to put it into practice to speak it. Gertrude has been very busy working with the different groups to prepare a number of books to be used for literacy. She spends much time providing them computer training so that they are able to type their own stories into the computer. It has been fun for them to learn something about computers which they have never had opportunity to even touch before this class. After the course is over Gertrude and I are going to take a little vacation on a neighboring island. We are looking forward to having some down time just to relax. Please pray that we have good weather as we are traveling by boat.